This evening I took out on my horse for a workout ride; just covering some ground and riding fence lines. I have heard it time and time again, the worst day on a horse can be the best day on the ranch. And I will tell ya right now, there is much truth to that. We rode up and down the hills with my dog trailing along. We came up to a slough and my ole horse just treaded on strong, never even got excited when she was up to her knees in the muck. However, I gotta say, I was a little worried for a minute. I should have more faith in my horse. We run up on an ole Brangus cow with a two-day old calf. She greeted us with a snort and a sneer when Katie leaned down to sniff of her calf. My ole horse never jumped just looked that ole cow in the eye. That may get me into trouble one day, but at least I know she will not blow up. As we rode up to the barn, Katie moved right into that quick easy trot. Some horses get rough, but I will say she has one of the easiest I have ridden. I bumped her into a slow lope and there is not much that will compete with that feeling of riding in sync with your horse. Just a man and his horse, moving right along to the beat of the hooves and the creak of the leather. The sun was just setting as I rode up to the barn, I tied Katie up so she could cool down. It’s been quite a while since I have taken the time to enjoy a sunset, so I walked right out to the pasture and sat down. The sky was filled with gold and red, the clouds dotted, harmless in the sky. The ole bull frogs, who have awoke with this warm weather were gearing up their chords on down in the slough. The heifers were grazing slow and a young black calf run across the horizon. As the sun set low the night air set in, still warm and humid, I could not help but smile and think I can’t wait til summer. 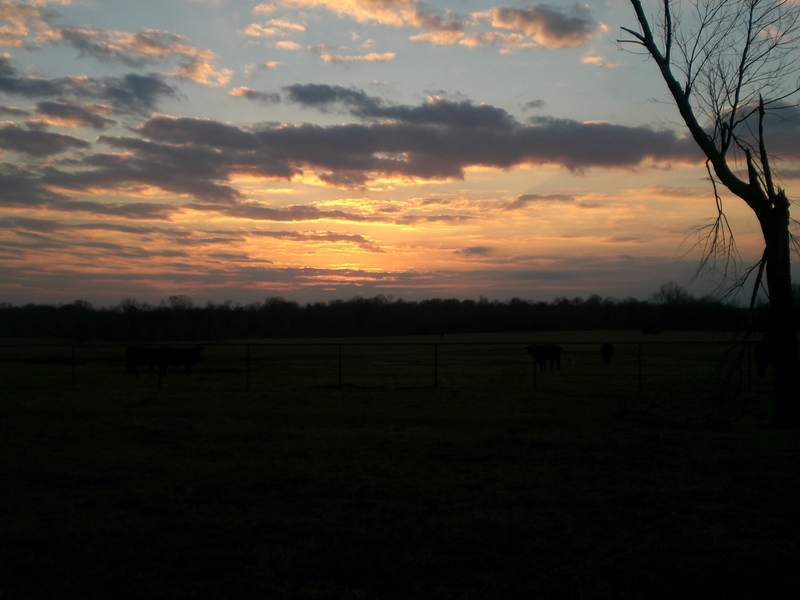 There is nothing like the peace and solitude of sitting to watch a sunset on the ranch. The days may get long and tiring, but just a few moments at the end of the day can make the world seem better. The romanticism of the Wild West is long gone. The cattle drives and camp fires, nothing but a painted picture. But I will tell ya there is still something that gets to me about this life on the ranch. A sure-footed horse, a good cow-dog, and any good ride; this is when I say God is grand. I do not care if I barely scrape out a living, because I have the life right here. But I’ve heard it said that ol’ cowboys don’t die: They get put out to pasture way up the sky. So if God’s got a Heaven for old cowboy legends, I hope the grass is greener on the other side, An’ he’s got good horses to ride. I am 100% positive God has good horses for us in heaven. There’s no doubt in my mind actually. Thanks for sharing. I’m ready for some weather like that around here! Sounds like the perfect afternoon! Loved this post! It made me think back to the days I spent on the back of my favorite horse, they were some of the best.